Hard-burning work from the Timeless All Stars – a group named after their record label, but who have a heck of a lot more going on at the core! This isn't just jam session material, as is often the case with an "all stars" group – but instead really well-matched, well-conceived performances by a group who are almost an extension of the earlier pairing of vibist Bobby Hutcherson and tenorist Harold Land – augmented here with the fantastic presence of Curtis Fuller on trombone, Cedar Walton on piano, Buster Williams on bass, and Billy Higgins on drums! 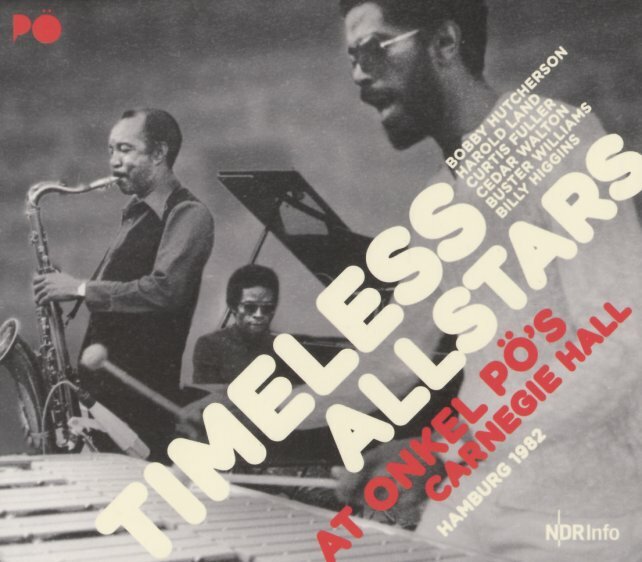 All players are wonderful – really bringing their a-list game to the performance – which was captured at the Onkle Po club in Hamburg, with very long tracks that spin out in even more space than on the group's albums for Timeless Records. Titles include "Clockwise", "Mapenzi", "Tokudo", and "My Foolish Heart". © 1996-2019, Dusty Groove, Inc.